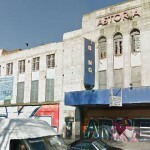 An application to demolish Brighton’s Astoria cinema is set to be approved tomorrow. Owner Mike Holland has again applied to tear down the Grade II listed building and put a new block of cafes, community rooms and flats rising to six storeys in its place. Brighton and Hove City Council will consider the application tomorrow, and officers have recommended they grant it. The 1030s Art Deco cinema was first turned into a bingo club in the mid-seventies and operated as such until 1997. In 1998, permission was granted to turn it into a horror-themed nightclub, but it never opened as a drinks licence was refused. Brighton’s percussive dance group Stomp bought it in 2001, but then sold it on to Mike Holland for £2.2million in 2007. He attempted to sell it in 2008, but in 2012 he successfully applied to demolish it, despite it having being listed in 2001. His original plans for its replacement were an office block of two storeys at the front rising to six storeys at the rear, with a cafe and community rooms on the ground floor. His latest plans put an extra storey on the top and six flats on the fifth floor. Officers have also recommended that councillors be minded to grant this, subject to conditions. Leave our heritage alone! When I was young and living in Brighton (I’m not old by the way! ), the history of the town was part of our curriculum. ‘Brighthelmstone’, later Brighton, has an amazing history and should be celebrated and preserved. Fed up with tourists settling here and then wanting Brighton modernised for more tourists! Unless you own a business in a tourist spot all you gain as a resident is higher council tax and parking charges! No suprise.. People need to get it listed as an asset of community value before its to late! So they want to pull down another chunk of our history!! Grade 2 listed obviously counts for nothing when greed takes over … Its all about money nowadays!!! If it must be turned into an office block etc. then it should have the facade left as it is to make sure the heritage is kept AND the fact that it is grade 2 listed. It is about time this council did its’ job properly and listened to what the local people want, NOT outsiders! What on earth is the point of listing buildings when the council can simply override it when they choose? in a village local to me the council wont so much as let ppl repaint a window without sticking their noses in and insisting on just the right shade. For all you whingers moaning on about it, it’s been empty and unused since 1997! Buildings like this and the Hippodrome sit crumbling until they end up beyond salvaging like the West Pier. Ineffectual local residents waffle on about “heritage” and “saving them” but do absolutely zero of practical use about it. It is indeed “all about money”, and none of the whingers ever seem to want to put any where their mouths are. How could they be “unnatural” if they are in my nature? Do try to make sense! I think feline 1 has a positive attitude . I for one , would gladly give her a saucer of milk . and stroke her tail. if she let me .